DA Form 3680-1 - also known as the "Parade Of American Music Entry For Army Composers" - is a Military form issued and used by the United States Department of the Army. 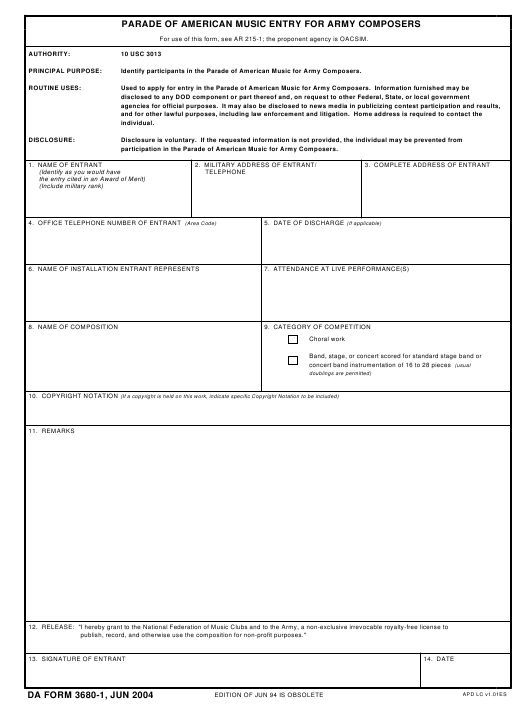 The form - often mistakenly referred to as the DD form 3680-1 - was last revised on June 1, 2004. Download an up-to-date fillable PDF version of the DA 3680-1 below or request a copy through the chain of command. For use of this form, see AR 215-1; the proponent agency is OACSIM. Identify participants in the Parade of American Music for Army Composers. participation in the Parade of American Music for Army Composers. publish, record, and otherwise use the composition for non-profit purposes."